From May to September each year, the Denali Princess Wilderness Lodge, Copper River Princess Wilderness Lodge, Mt. McKinley Princess Wilderness Lodge and Kenai Princess Wilderness Lodge host guests from around the world at these breathtaking locations across the state. As the leaves begin to turn and the fall winds become brisk, the lodges’ staff sees the last of their summer guests off to destinations around the globe. But what happens once all of the guests have gone and the lodges close for the season? Preparing the Princess lodges across the state of Alaska for the summer visitor season itself is a process worth noting: from truckloads of locally-sourced groceries to crews of workers and tour desk operators, it’s safe to say it takes an army of people to prepare the lodges for the summer season. 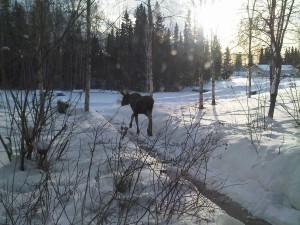 But the winters at the lodges are busier than you might think. Caretakers work to keep the lodges in tip-top shape for the following summer and the conditions they work in are not always favorable. Wells and his coworkers wear insulated boots rated for 60 below zero, and hats with earflaps long enough to protect most of their face. Even blinking becomes a challenge in these temperatures. Layers are key in this type of work environment where, during a regular winter workday, caretakers complete twice-daily rounds of snow plowing to keep driveways and pathways clear, check the building and monitor mechanical room temperatures and gauges. They move inside to repaint doors and haul water from the well to the maintenance-building tank for use in showering, drinking, cooking and more. Indoor projects such as filing or other office work are loathed or coveted, depending on the weather’s whims, according to Wells. The winter season at the lodge often feels like hibernation to the caretakers, who are 120 miles away from the closest grocery store and see minimal hours of daylight around winter solstice. But winter is also a blessing in a way, allowing the caretakers time to recharge after a nonstop summer schedule. Wells said they take the winter one day at a time until summer comes and there is life again. However not all of Princess’ Alaska lodges close for the winter – the Fairbanks Princess Riverside Lodge stays open year round providing full service accommodations to local guests and out of town travelers. It is the perfect spot for conventions or a quiet winter vacation away from the hustle and bustle of everyday life. Winter vacation or summer adventure, the next time you stay at one of the Princess Lodge locations make some time to enjoy the hospitality and your surroundings and be sure to take a moment to appreciate all the hard work that goes into keeping these amazing lodges in great shape for all to enjoy.